With recent advancements in high definition and megapixel cameras the market for video surveillance and VSaaS is likely to witness heightened opportunities. Furthermore, the rising popularity of do-it-yourself (DIY) video surveillance for home security, the market will gain increased momentum in the coming years. On the downside, privacy concerns and high cost of IP video surveillance market will continue creating bottlenecks for the market. 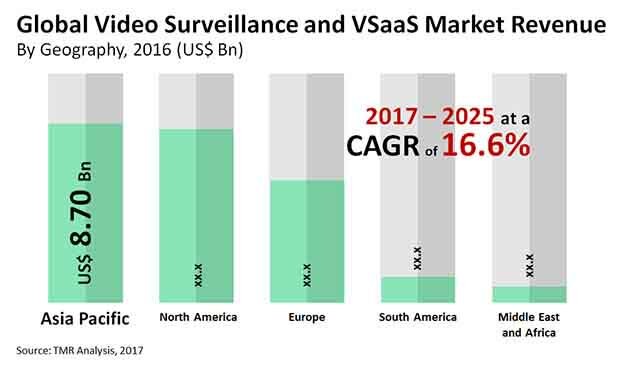 Overall, the global video surveillance and VSaaS market is expected to rise at a CAGR of 16.6% between 2017 and 2025. At this pace, the market’s valuation will reach US$101.70 bn by the end of 2025, from US$25.11 bn in 2017. On the basis of type, the video surveillance and VSaaS market is bifurcated into analog and IP-based systems. Of these, IP-based surveillance systems have rapidly gained the larger share in the market due to their inherent advantages of quality, scalability, better resolution, and built-in analytics engines, as compared to analog video surveillance. Considering these, the IP-based surveillance systems segment will rise at a CAGR of 20.8% between 2017 and 2025. On the basis of component, the video surveillance and VSaaS market is categorized into hardware, software, and services (VSaaS). Video surveillance hardware includes surveillance cameras for capturing video footages, recorders and storage, encoders, and monitors. The software segment includes video management software (VMS) and video analytics software. Based on the service delivery architecture, the VSaaS types include hosted, managed, and hybrid services. The increasing demand for IP cameras has led to the significant growth of the video surveillance hardware market. However, the VSaaS market is expected to grow the fastest due to rising demand for the storage of large volumes of data generated through IP cameras. On the basis of end user, the video surveillance and VSaaS market is segmented into the residential, retail, business organizations, transportation, government buildings, industrial, and others segments. Of these, the transportation and retail segments will account for the leading market shares through the forecast period. The threat to public security will continue to rise, which will increase the use of video surveillance systems. Furthermore, these systems help protect innocent civilians from terrorist attacks and maintain a safe and secure environment. Regionally, the global video surveillance and VSaaS market is segmented into Asia Pacific, Europe, Latin America, North America, and the Middle East and Africa. Among these regions, Asia Pacific will emerge as the leading contributor to the global market, exhibiting a CAGR of 20.2% between 2017 and 2025. The regional market will continue offering lucrative opportunities on account of the growing economies and increasing construction projects in India and China. Also the Asia Pacific market is gradually shifting toward IP-based video surveillance systems from their analog counterparts to cater to the rising demand for improved image quality. This paradigm shift will enable the regional market exhibit steep growth through the forecast period. Some of the most prominent vendors operating in the global video surveillance and VSaaS market are Hikvision Digital Technology Co., Ltd., Axis Communications AB, Bosch Security Systems, Inc., Canon, Inc., Cisco Systems Inc., Zhejiang Dahua Technology Co. Ltd., Honeywell Security Group, Agent Video Intelligence, Geovision, Inc., Genetec, Inc., Panasonic System Networks Co. Ltd., and Pelco, Inc. This report on the global video surveillance and VSaaS market provides analysis for the period from 2015 to 2025, wherein 2016 is the base year and the years from 2017 to 2025 are the forecast period. Data for 2015 has been included as historical information. The report covers all the prevalent trends and technologies playing a major role in the growth of the video surveillance and VSaaS market over the forecast period from 2017 to 2025. It also highlights the various drivers, restraints, and opportunities expected to influence the market’s growth during the said period. The study provides a holistic perspective on market growth throughout the forecast period in terms of revenue estimates (in US$ Bn) across different geographies, which include North America, Europe, Asia Pacific (APAC), Middle East & Africa (MEA), and Latin America (LATAM).